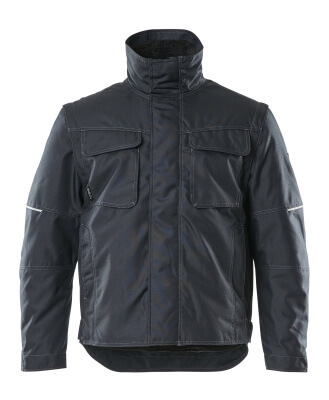 4-in-1 jacket with detachable sleeves and lining. Breathable, windproof and water-repellent. Pile collar. Pile lining can zip out. Fastening with zip, storm flap and hidden press studs. Removable sleeves. Extended back. Zipped pocket under storm flap. Chest pockets with flap and hidden press studs. D-ring. Ergonomically shaped sleeves allows high freedom of movement. Front pockets. Inner pocket with zip. Rib (hidden in storm flap) and press stud fastening at cuffs. Internal drawstring adjustment at the hip. Waist with press stud adjustment. Contrast stitching. Reflectors.